Purchasing your first home is one of the most rewarding and biggest financial decision that most people make in their adult lives. We want to take this time to remind you that saving money doesn’t end once you’ve placed your down payment and bought your home. It should continue once the keys have been officially handed over to you! We’ve put together a list of the top 10 ways to save money as a new homeowner. These are simple tricks that every homeowner should be aware of. We hope these tricks help your savings account grow for many years to come. 1. Install LED or CFL light bulbs throughout your home. They will save you money on your monthly energy bill and also last much longer than incandescent bulbs. They also run cooler than incandescent bulbs which means your air conditioner won’t have to cool the heat put off by the bulbs. If you’re not wanting to change out every single bulb upfront, we recommend choosing to place them in the most used areas of the home. 2. Install a programmable thermostat in your home. This will allow you to schedule changes in your home’s temperature while you are typically away. Giving your furnace or air conditioner a break for the time when the home is empty will make a big difference in your bills. If you can’t afford to install a new thermostat right away, you can do this manually! Change the temperature as you walk out of the house. 3. Check all of your plumbing for leaks. This may seem simple but a leaking faucet or two can result in a higher water bill. If there is more significant damage to the plumbing, you will be spending much more money on the running water. You also have to consider the issue that mold tends to grow in damp areas if they’re not addressed. 4. Install a clothes line in your laundry room or outside. Hanging clothes to dry can result in substantially lower energy bills. 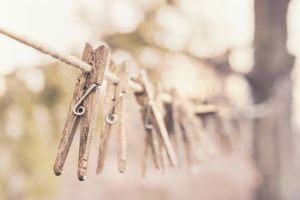 Even if you only hang some of your clothes and use the dryer for the rest, there is less money going out of your pockets with each clothes pin hung. 5. Install and use ceiling fans! Fans can cool a room by up to 7 degrees. Running a fan while you’re in a room means that your thermostat can be set that much higher and will result in the air conditioner running less. 6. Invest in energy efficient appliances for your home. Most people use their kitchen appliances daily. This means that any bit of energy savings for each appliance is then multiplied by how often that appliance is used. This is a great long-term investment for your home. 7. Make sure that insulation is placed throughout your home. This means along outside walls, in the attic and around water pipes. This helps to regulate the temperature inside the home and in the water pipes. 8. Replace your air filters! This is probably the quickest and easiest project on our list, yet it is often overlooked. An old filter causes your HVAC unit to work harder and use more energy, resulting in higher bills for you. 9. Make sure your home is properly sealed. Check doorways, windows and electric outlets. This again will help your energy bills stay low and your HVAC unit working less. 10. Plant shade trees around your home or use blinds or curtains to block the sun from coming through the windows. These will help keep the home cool in the summer months and stop your air conditioning from constantly trying to keep up with cooling from the heat of the sun. Take our advice and make sure you follow these simple tricks in your new home! We promise that the savings will add up throughout the years in your home. If you have any questions about this list or anything else related to real estate, don’t hesitate to give us a call 309-319-6030!